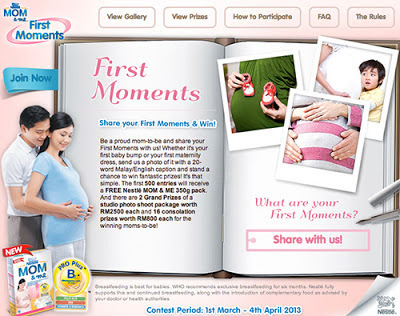 First 500 approved entries: FREE Nestle Mom & Me 350g pack. Submit a photo of your first moments whether it's your first baby bump or your first maternity dress. Describe your photo in not more than 20 words in Malay or English. Register your personal details and wait to see if your entry is chosen to be a winner! Visit Nestle Mom & Me for more details.